As we start Series 7 of TCBA Gold’s second season, the Bergen Barflies hold the league’s best record of 19-9 and the largest lead of any divisional leader, a scant game & a half over the Islanders of Long Island (17-10). It looks to be a long season for both the VitaMen of Hyde Park and the Ainspans of South Starrucca, as both clubs are off to miserable 7-20 starts, looking up at the divisional front runners. The league’s 2nd best record belongs to the Fortney Gators (18-10) who cling to a slim one game lead over the Baltimore Baysox (17-11) in the David Brown Division. Baltimore holds the best home record in the league, having won 11 of 14 in the friendly confines. The Norfolk Pilots are right in the chase as well, just three games off the pace at 15-13, thanks in part to an 8-2 record with home cooking. Kilkenny, on the other hand, has struggled at home, winning only 5 of 18 contests and is stuck in 4th place, 7 games behind the leaders at 11-17. The tightest race is in the Shiloh Division where only five games separate top from bottom. The Cleveland Spiders sit atop the Division with a mark of 17-11 but are just one game in front of the Mimosa Mirthmakers (16-12). One secret to the Spider success is a mark of 8-2 on the road. In 3rd place, with a league best 10 road wins are the Newmarket Ehs (15-12), just a game & a half behind the Spiders. Bringing up the rear are the Wilderness Wraiths, mired in a 4 game losing streak. The remaining Division saw a change in leadership when the Siouxland Explorers (15-13) snuck ahead of the Bradenton Buckeyes (14-14) in a face to face series, now leading by one full game. Both the Mexicali Mallards and the Waukesha Freemen are off to slow starts at 11-17, but trail the Explorers by only four games early in the season. Interestingly, all four clubs are a perfect .500 at home. The injury bug has hit already, the hardest to Bradenton’s long reliever Al Mamaux (19) and Baltimore’s flychaser Johnny Mostil (13). Siouxland has suffered three injuries – Larry Kopf (4), Ty Cobb (3) and Bubbles Hargrave (2). Pitchers Buck Freeman (Cleveland – 4) and Elmer Myers (Kilkenny-2) join Hyde Park’s Ira Flagstead (1) as others on the injured list. The league is hitting .289, led by a robust .347 of Cleveland and a potent .339 by Bergen. Kilkenny (.242) and South Starrucca (.253) are having the toughest time hitting the ball. Bergen’s .485 slugging percentage sets the pace, due in great part to a league leading 31 homeruns. Mimosa’s 23 round trippers is next best, while Kilkenny (6) and Fortney (8) have had the hardest time hitting dingers. Bergen also leads the league with 190 runs scored, more than 100 more than the troubled offense of the Gaelics (83). Long Island’s ERA of 2.98 is the league’s best, slightly better than the 3.02 mark of the Baltimore Baysox. Baltimore’s success is due in part to a league leading 7 shutouts. Bradenton and Fortney are the only two teams without a shutout to date, but the worst ERA belongs to South Starrucca (5.92). The league is averaging an ERA of 4.18. Despite a 5.63 ERA, the VitaMen own a league leading 4 saves. Wilderness (.989) leads the league in fielding and in double plays (39). Norfolk and Mimosa (.970) have had porous gloves afield. Bradenton (26 of 32) has been the easiest team to run against while Baltimore and Bergen are the only teams yet to commit a passed ball. Norfolk (5 of 19) and Mexicali (4 of 13) have been the toughest teams to steal against. Bradenton’s Urban Shocker (6-1) leads in games won while Baltimore’s Ray Oldham has a minuscule 0.80 ERA after 45 innings of work, registering three shutouts in the process. Carl Mays of Long Island has logged 70 innings of work. Dutch Leonard of Norfolk, and some kid from Mexicali named Big Train have 41 strikeouts apiece. Bergen’s Harry Heilman sets the pace in batting average with an incredible .464 while George Herman Ruth is slugging at an .821 clip for Mimosa. This pair is 1-2 in on base percentage (511, .504) as well, with Ruth leading the league in runs scored (31), walks (25) and homeruns (11); and Heilman besting the league in hits (58). Bob Meusel of South Starrucca breaks the pair’s lock on league leadership with 31 RBI, but guess who places 2nd (Heilman 30) and 3rd (Ruth 28). Rabbit Maranville of Fortney leads in doubles with 13, one better than Mexicali’s Tristam Speaker. Baltimore’s Max Carey (12) and Frankie Frisch (9) set the pace in stolen bases. 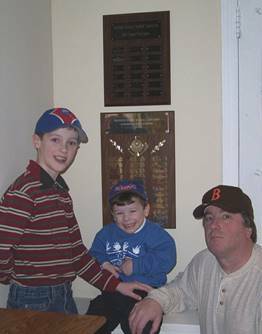 Stu McCorkindale with his two sons in February of 2002. 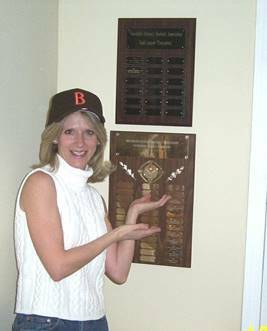 Sue McCorkindale with the plaques.